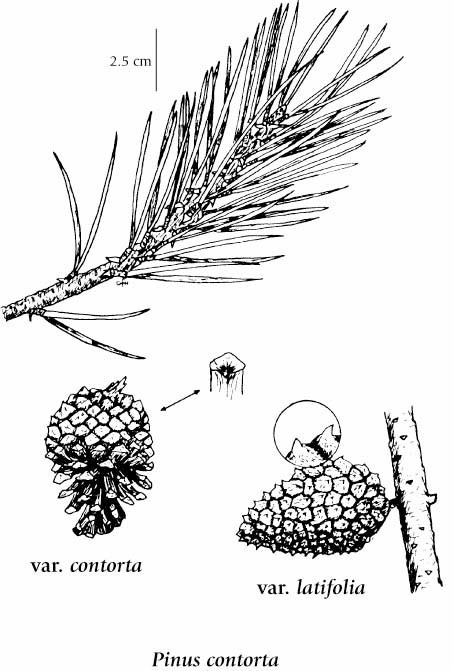 This is an evergreen coniferous tree species that is common in British Columbia. Tree, mostly to 30 m tall, but up to 40 m; var. latifolia mostly straight and columnar with narrow rounded crown, var. contorta often somewhat contorted and even bonsai-like; bark reddish-brown to blackish, cracked at the base and somewhat flaky above, furrowed and thicker in var. contorta. Needles in groups of two, usually curved and slightly twisted, 2-7 cm long; deep green in var. contorta, yellowish-green in var. latifolia. Seed cones egg-shaped, lopsided, 3-6 cm long; stiff bracts with armed tips; serotinous; cones point backwards on twig in var. contorta, outward in var. latifolia; pollen cones reddish-green in clusters at tips of branches. See above re hybridization with P. banksiana. Two varieties are generally recognized in BC. Wet to dry bogs, lower slopes and high river terraces in the lowland, montane and subalpine zones; common throughout BC; N to S AK, YT and SW NT, E to W AB, and S to CA, UT, CO and SD.